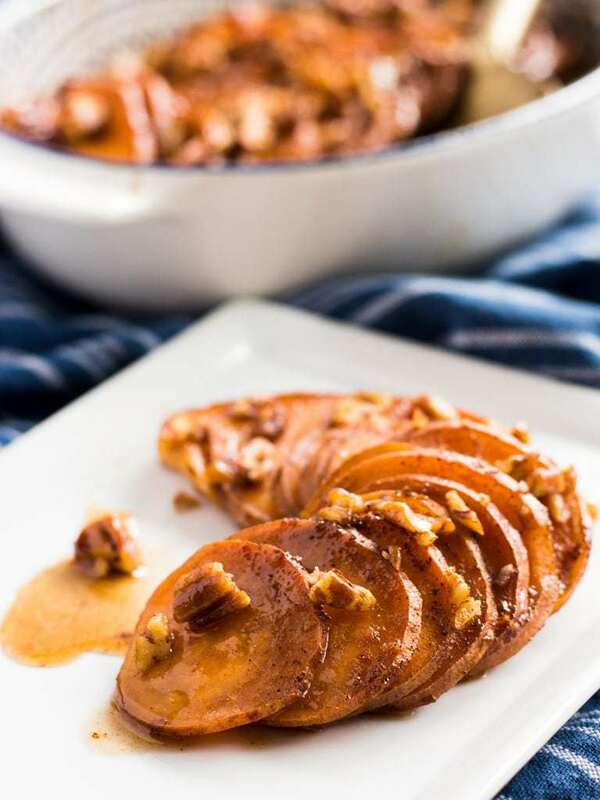 Bourbon maple glazed sweet potatoes will leave your Thanksgiving guests wanting more. Savory sweet potatoes cloaked in maple glaze is the perfect side dish. Favorite Thanksgiving food—GO! Okay… that’s not fair. 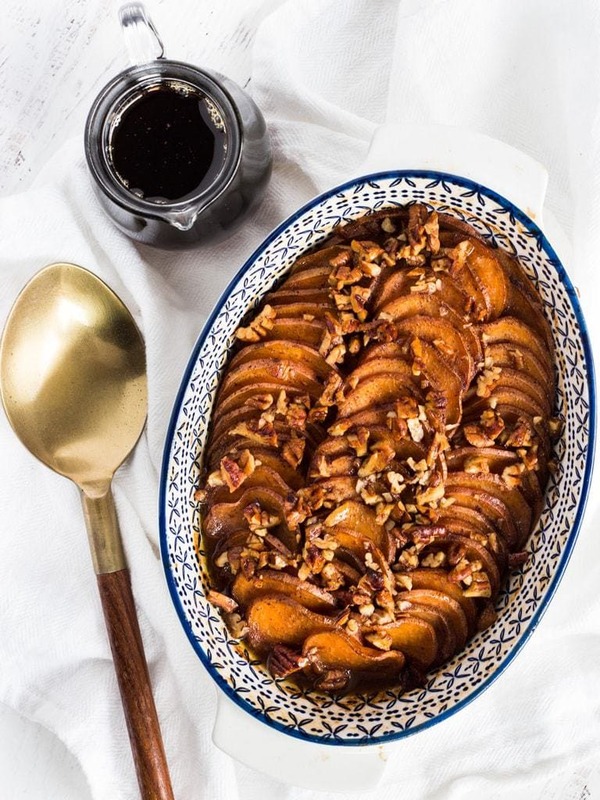 Each food has a special place in my heart, but one of my favorites is the sweet potato dish. 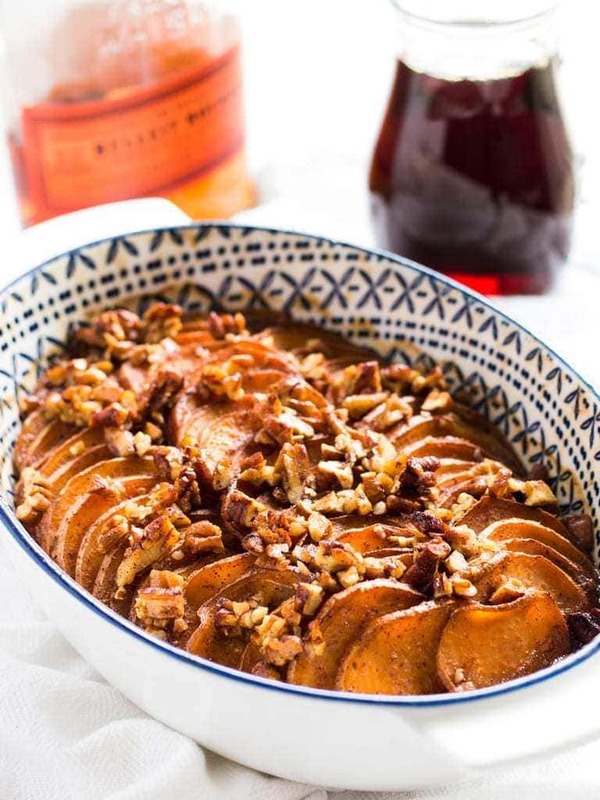 Yes, that’s my sweet tooth talking again and this time it’s calling for bourbon sweet potatoes. Usually I take the reins when it comes to dessert and bake a pecan pie or something, but this year I wanted to try my hand at a side dish. Sweet potatoes it is. To differentiate its consistency from the mashed potatoes, I opted for a gratin-like style of potatoes, sliced into 1/4-inch thick disks. Keeping the skins on also gave the potato slices a crispy edge. The best method to get nice and thin potato slices is to use a mandolin. This handy kitchen tool makes the job quick and easy. If you have a steady hand and sharp knife, the old fashioned slicing method works too! Let’s be honest though, the star of this dish is the glaze: Spiced maple bourbon brown sugar butter glaze with chopped pecanss (it wouldn’t fit into the title, so here it is now). Yes, it sound like a little much. Yes, it is as good as it sounds. And yes, bourbon sweet potatoes may or may not add to your Thanksgiving buzz you got started during cocktail hour. 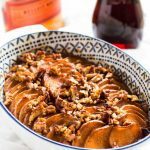 This bourbon maple glazed sweet potato dish will add a lot of flavor to your Thanksgiving table. It’s sweet, savory and delivers a kick with the bourbon. Are sweet potatoes your favorite side dish? If not, this recipe might change your mind! In a small bowl stir together the bourbon, maple syrup, brown sugar, butter, cinnamon, nutmeg and all spice. Gradually add corn starch and stir until the mixture reaches a sauce-like consistency. Set aside and reserve 1/4 cup separate. Rinse and scrub sweet potatoes. Cut the ends off and cut the rest of the potatoes into slices about a 1/4-inch thick. 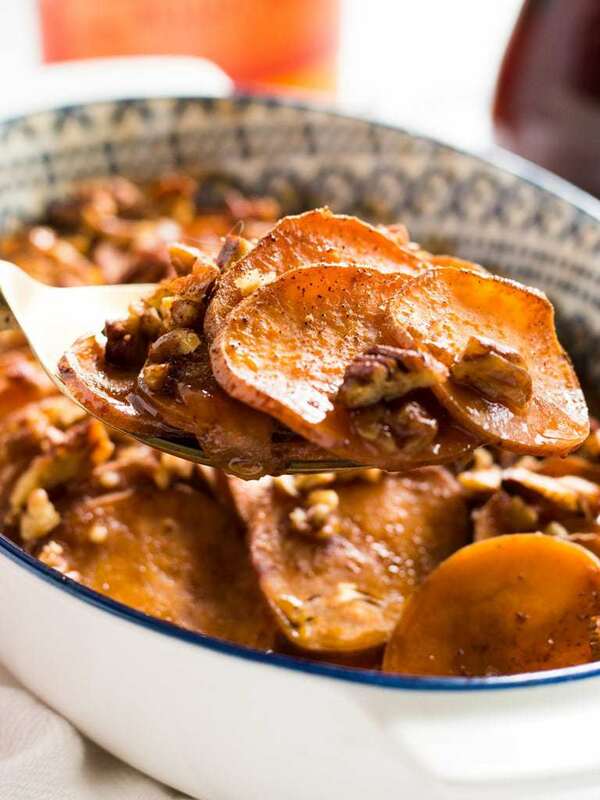 Place the sliced sweet potatoes into a large bowl and toss with bourbon-maple mixture (remember to reserve 1/4 cup). Let the potatoes soak up some of the sauce as you preheat the oven to 400° F. Spray a 10-inch oval casserole dish or 9x9 baking dish with some nonstick cooking spray. Line up the slices in the prepared baking dish. If there is any glaze left in the bowl, pour it over the potatoes in the baking dish. Cover the dish with aluminum foil and bake for 40 minutes. While the potatoes are cooking, take the 1/4 cup of reserved maple-bourbon mixture and stir in the chopped pecans. If you feel the glaze is too thick, add a tablespoon more syrup. After 40 minutes of baking time has passed, remove cover and pour the pecan glaze on top of the sweet potatoes. Place the dish back into the oven uncovered and bake for 10 more minutes. The sweet potatoes are finished when they are tender when pierced with a fork. This side dish can be made up to 6 hours in advance. Let it stand at room temperature and rewarm before serving. Hello, I want to make this for my families Thanksgiving this year. Just curious how you would work the ingredients of tripling the recipe? Thank you. I made today for Thanksgiving using ingredients on hand, added sliced Granny Smith apples and persimmons (2ea) and Calvados instead of Bourbon. Filled the house with an amazing aroma as it baked. My sister I sat next to said it was the best thing on her plate. Cheers to you for a toothsome dish! I am looking forward to making this side. You say it may be made up to 6hrs ahead of time then reheat. Does this mean the recipe cannot be made a day or two ahead of time? Hi Richard – I do not recommend making this recipe too far ahead of time as the potatoes will get mushy and lose their round shape when served. Can I make this without bourbon? Or what can I substitute for the bourbon?